2013 - Olomouc (CZ) – Nova Ulica. The historic tram set waits in the loop at Nova Ulica with part of Olomouc city centre visible in the distance below. 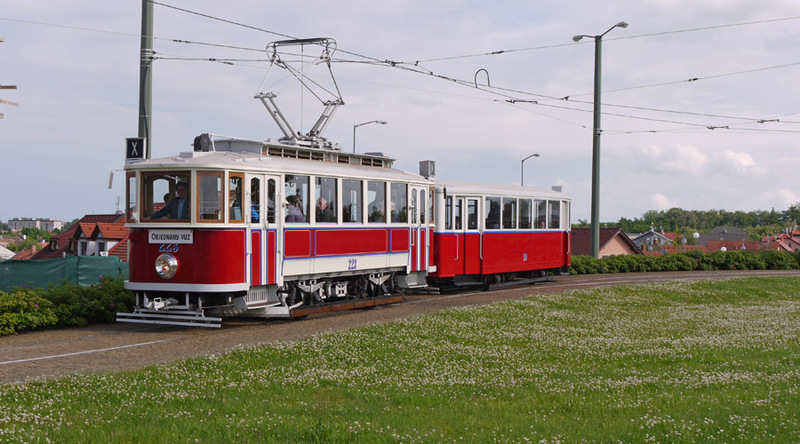 This motor tram was first operated in Praha in 1930 – Praha still has several of this type in their museum. It came to Olomouc in 1975. I think the trailer has always been in Olomouc. This is Neředín loop. The trailer 99 is from Ostrava, it came to Olomouc in 1988.